Georgian selfie? 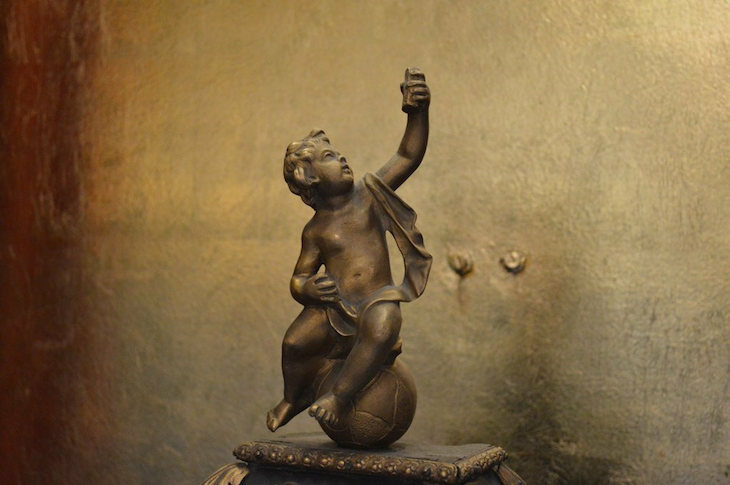 We spotted this little cherub on top of a clock in Armourers' Hall near Moorgate. Image by M@. Medieval selfie? 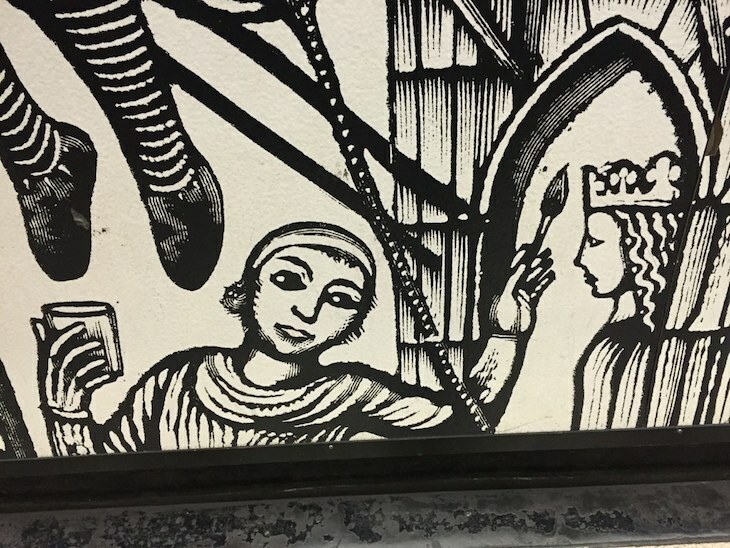 The tube platforms at Charing Cross contain a famous set of illustrations by David Gentleman, showing construction of the original Charing Cross. If you look closely, one of the artists appears to capturing his handiwork on a smart phone for posterity. Image by M@. 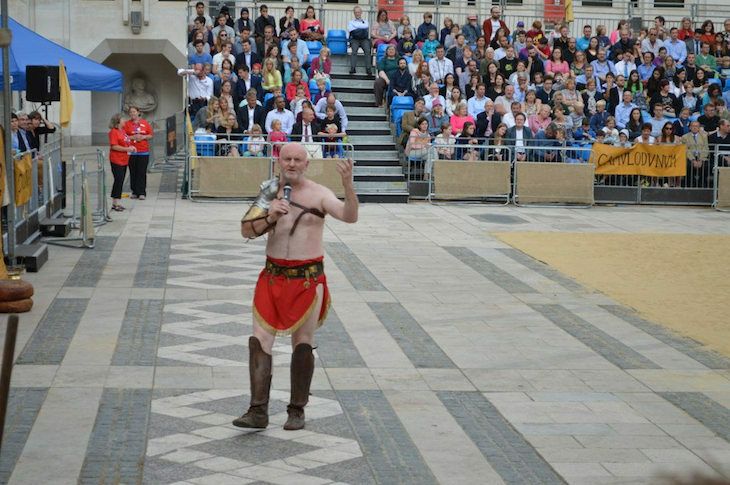 Museum of London's 2015 Gladiator Games at Guildhall were a right laugh. Our compere for the evening certainly looked the part, right down to his third-century AD roving microphone. Image by M@. 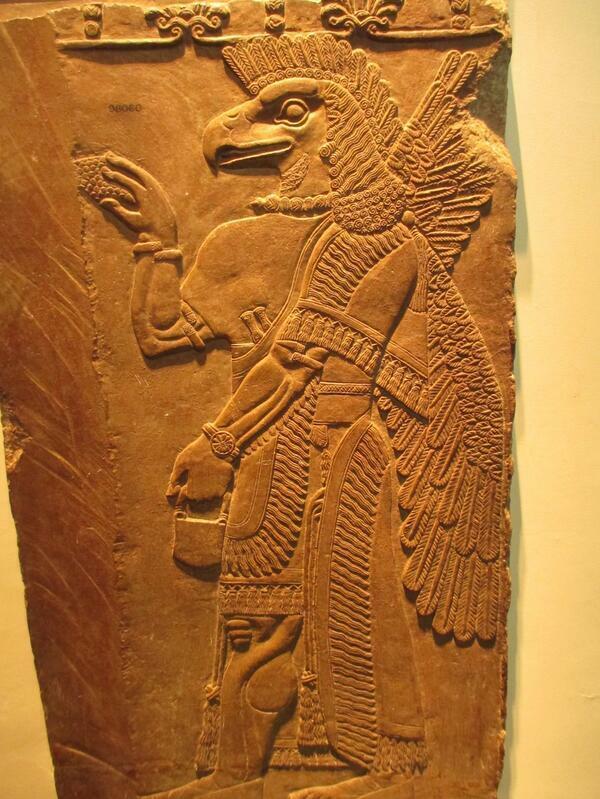 Stuff you learn at the British Museum, number 237... the Assyrians invented both the wristwatch and the manbag. Image by the author. 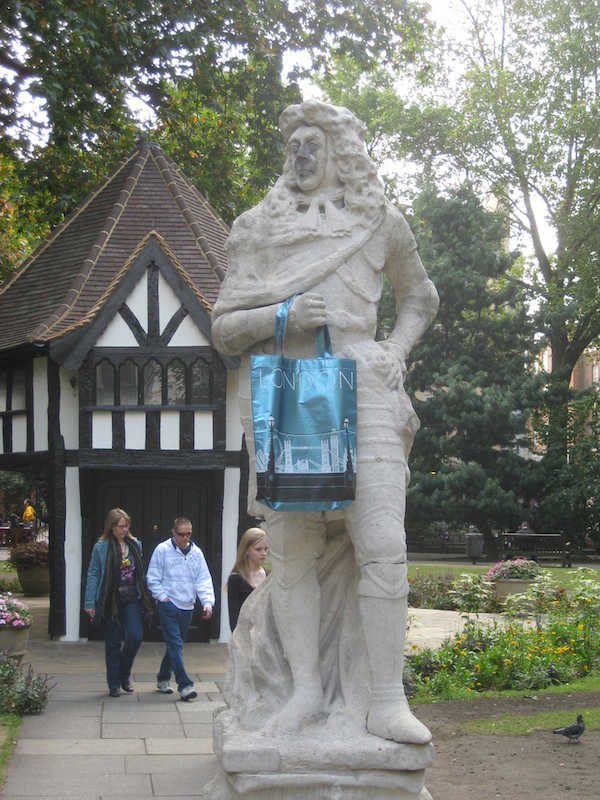 Charles II in Soho Square, taking a break from his Oxford Street shopping. Image by the author. The Lost Island Encounter mini-golf course in New Eltham is a slightly down-at-heel wonderland of giant lizards and dimpled balls. Most of the dinosaurs are a bit scraggy. 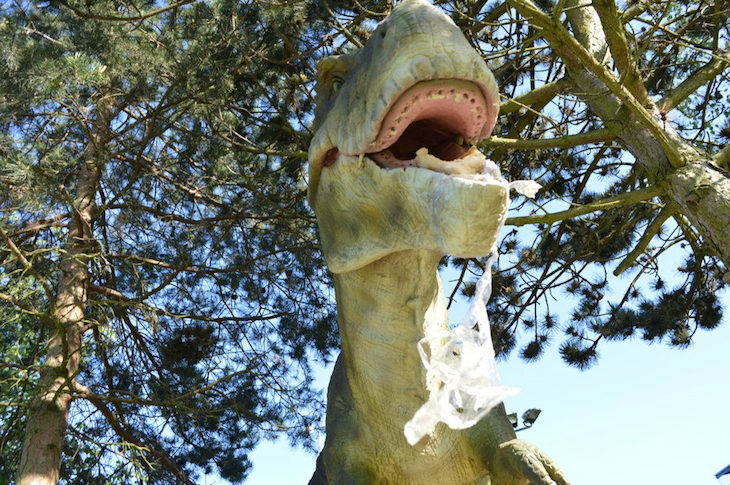 This T-Rex chomps down on some cellophane wrap, formerly holding his jaw together. A nearby crested dinosaur sported a roll-up cigarette. Read our write-up here. Eros? Anteros? Angel of Christian Charity? 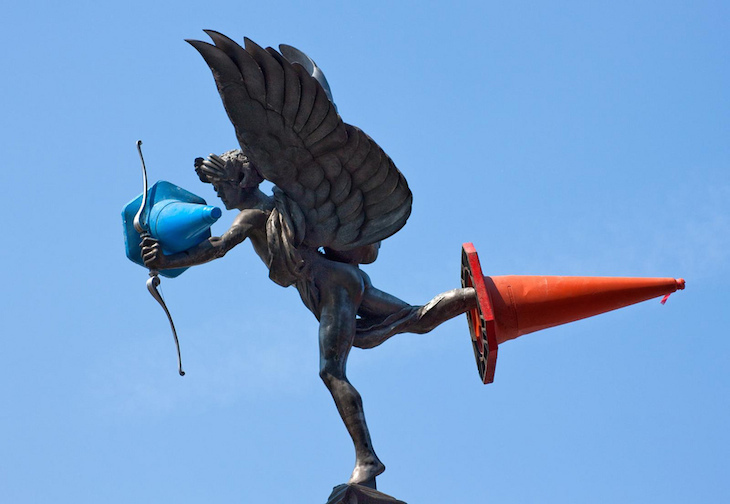 Debate still rages on the identity of this famous statue in Piccadilly Circus. Whoever he is, he's clearly enjoyed a night on the town with a bunch of students, as pictured by Simon Kimber in the Londonist Flickr pool. Plaque to the future. 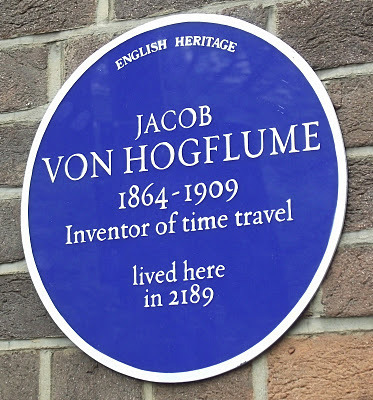 Peter Berthoud captured this memorial to the inventor of time travel, Jacob von Hogflume. The mysterious gent has had several plaques across the UK; this one was in Golden Square, Soho. London, more than most cities, is a patchwork of the ultra-modern beside the ancient past. Sometimes the different eras can rub up against each other a little too closely. 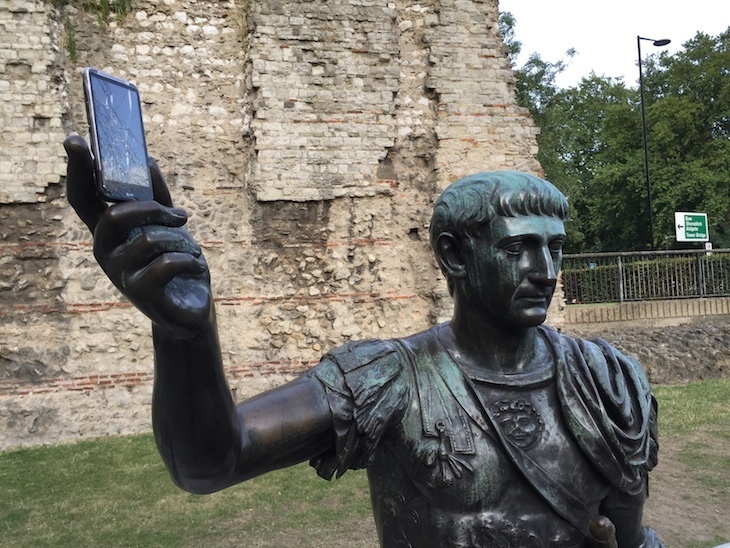 The gallery above shows a few tongue-in-cheek occasions when the past and present have co-mingled: from the Roman emperor with the mobile phone, to the inventor of time travel himself. Got a photo of a London anachronism? Send it to hello@londonist.com or link it up in the comments below.